Lexicillin: Can Patients Be Smart Healthcare Shoppers? 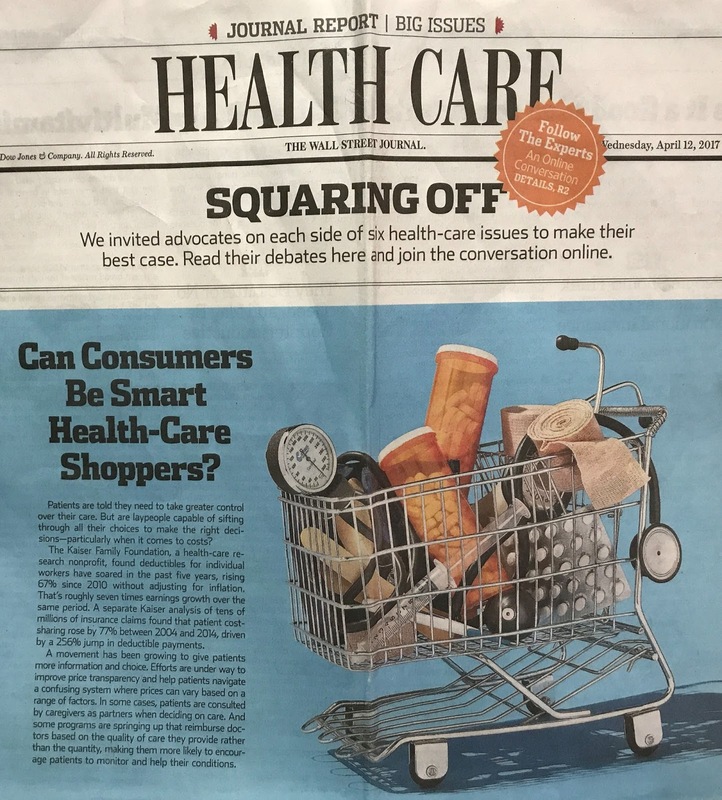 Can Patients Be Smart Healthcare Shoppers? I'm finally getting around to reading this special section of the Wall Street Journal on healthcare from April 12. First, I think you would to have some sort of diagnosis first because you went shopping for healthcare, unless you're acting in a proxy role such as a friend/relative or as the emerging trend of being a healthcare navigator. The Kaiser Family Foundation, a health-care research nonprofit, found deductibles for individual workers have soared in the past five years, rising 67% since 2010 without adjusting for inflation. That’s roughly seven times earnings growth over the same period. Then they provide the Yes/No face off between Drs. Devon Herrick and Amanda Frost. Devon's take is headlined: "There Are Simple Steps That Could Save a Lot of Money." He mentions the well-known trap of the free drug samples for new drugs that wind up with high prices for the refill. Imaging studies, e.g. CT scans, can be less expensive at a diagnostic service rather that at the hospital, and you can save money further by offering to pay for cash, although this might not be applied to your deductible. Because of the Internet, patients are becoming more healthcare literate, either by a trusted Web site or patient forum to understand and evaluate all the options for a particular diagnosis. But here's the problem: the diagnosis might not be certain or compete with a number of other potential diagnoses. This is known as the differential diagnosis. Unfortunately common illnesses tend to present differently for each individual, with a paucity of "classic" presentations. It takes a sharp clinician to discern troublesome cases, or the patient has to see a specialist, or even a series of specialists to find the right diagnosis. This is the case where the consumer approach becomes more difficult. Amanda's retort is: "The System Is Too Complex for People to Make Useful Choices." She says "Advocates for price transparency would have use believe that we, as "consumers," should consider our health care a product to be shopped for, like a pair of shoes." However, It is naive to think that merely presenting the options with the possible consequences to the patient works all the time. The physician has to be empathic to the patient's financial state, and how it might affect compliance. I remember being on the surgical service where a patient's hearth valve replacement had dehisced (broken open) because she decided to stop taking the antibiotic for her systemic fungal infection, but instead using the money for other purposes. Certainly healthcare is complex (even though we know the starting point of a treatment, we cannot be assured of the outcome for each patient), by some attempt has to be made by the patient with whatever help is available. And, again this present the need for a healthcare navigator who might be able to make is easier to explore options from a more practical standpoint, offering another view. Another problem not mentioned is that patients for the most part don't have a grounding in basic medical science and might think that they may save money by not taking the complete prescription of an antibiotic, say, "saving" it for the future or even offering to friend for an undiagnosed condition. 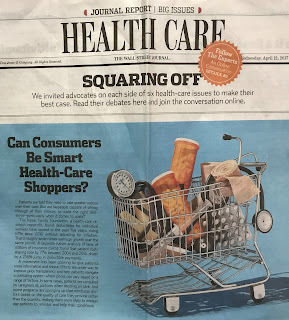 There are caveats to the limits of healthcare shopping that patients need to know about, and it should never become about making judgments of what is bad or good care. Improved decision making requires that desire to look at information from different sources and take the time when it's possible to carefully choose a plan of action.